As usual for Monday's bento, you will find I just created a quick and simple bento. This morning I had been very busy driving here and there with a bad traffic jam, typical for Monday morning. It is not getting better but it gets worse every year. Anyway, today's bento just contained 2 molded rice wrapped in cucumber layer with nori decoration, flower shaped carrots, 2 tamago, half of cherry tomato, mushroom with teriyaki sauce, and roasted duck. The cucumber layer was soaked in vinegar and sugar water for few minutes so it got sour sweet taste. I really want to join Debra's B.O.M.B with this month theme is 'roasting'. But since I didn't roast the duck myself but was take-out from a restaurant then I changed my mind to participate. I didn't do roasting a lot for our home meal, anything roasted will be from a restaurant hehehe ... (I was ashamed to admit this). Nothing really special for this bento, let's see what will I come up for tomorrow's bento. That a great idea using the cucumber to wrap your rice. I love ur bento's. looks so yummy as well. Lia, this is a great bento to me. I love they way you decorate the vege, feel refreshing.. The cucumber wrap are done so perfectly that I didn't realise they are cucumber until I read further! You always have great ideas Lia. And I totally agree with noobcook, your simple is consider perfect for me! Lia, your bento is so pretty and sounds so delicious. I'm with you I don't roast at home much either. I really like the cucumber wrapped onigiri! Kidlet would love that, I'm going to have to make some rice! Your bento lunches always look so beautiful and delicious! I love the soaked cucumber wrap - will be trying that one! Yes, you can TOTALLY submit to The BOMB for roasting. There's no rule that requires you to do the roasting. :) Please come on over and add you link. But no pressure to do so. This bento box is absolutely gorgeous! I love the idea of cucumber layer on the rice. Your bento makes me feel hungry, can't wait to go for lunch (^_^)..
@Vanessa : Thanks a lot Vanessa! 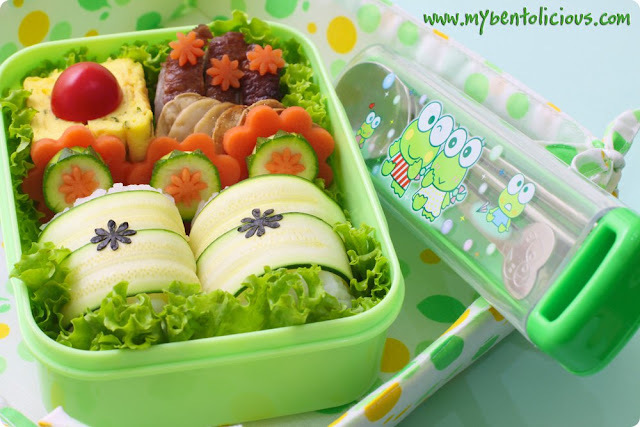 Lia, that is such a beautiful bento! So many details and the food looks delicious! Hope you are having a great week.